This Easy Frozen Oreo Dessert is light, frozen summer dessert… so easy to prepare – just perfect for Oreo cookie fans. One of my favorite frozen desserts. I love it because it is so easy to prepare. 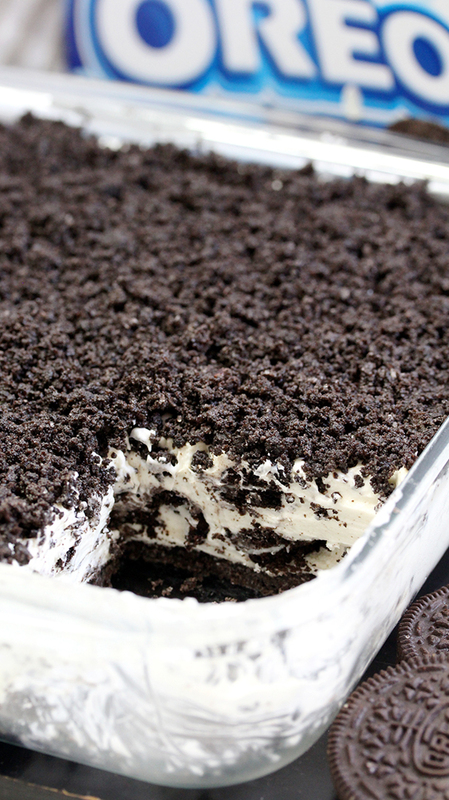 7 ingredients and a little free time is all you need to make Easy Frozen Oreo Dessert. The first layer is made of Oreo cookies and butter, than comes frozen layer of cream cheese, sugar, heavy cream, condensed milk, vanilla and crushed Oreo cookies with Oreo crumbs on the top. Yummy!!! 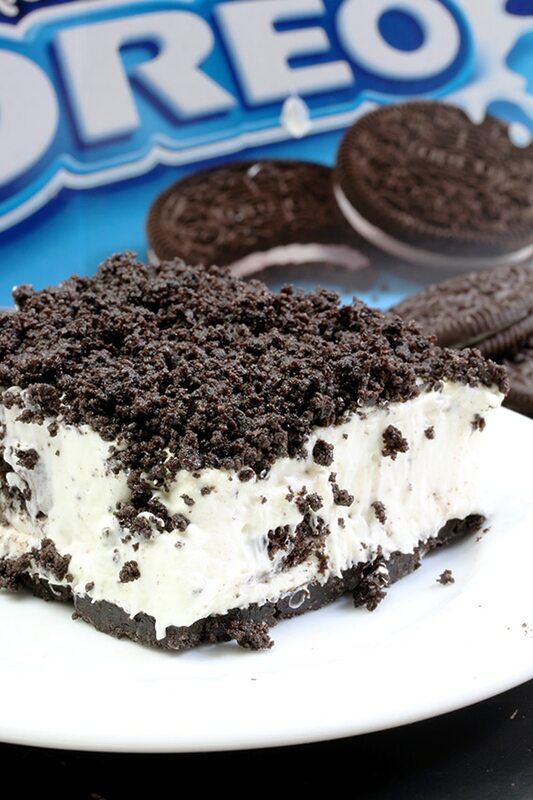 What do you need to make this Frozen Oreo Dessert? Sounds delicious and it really is! I love this quick, frozen delicious dessert. 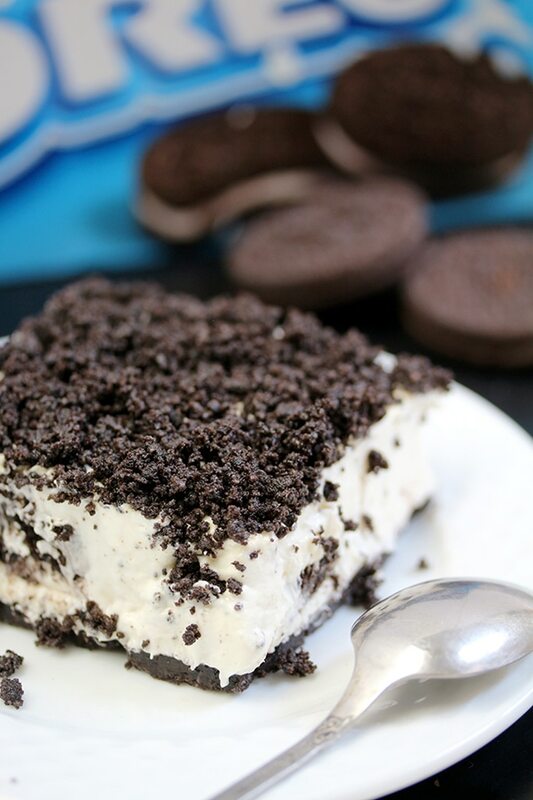 In my family, we all like Oreo cookies, so we love this frozen Oreo dessert, too. We usually have it in summer, but sometimes during other seasons, as well, when we feel like eating ice cream. How to prepare Frozen Oreo Dessert? Crush 10 Oreo cookies and set aside. Put the rest of the cookies in the food processor and crumble them. Combine Oreo crumbs and melted butter. Spread ½ of it in 8 x 8 or 9 x 9 inch square baking pan and press with your fingers or some firm object to form a layer. 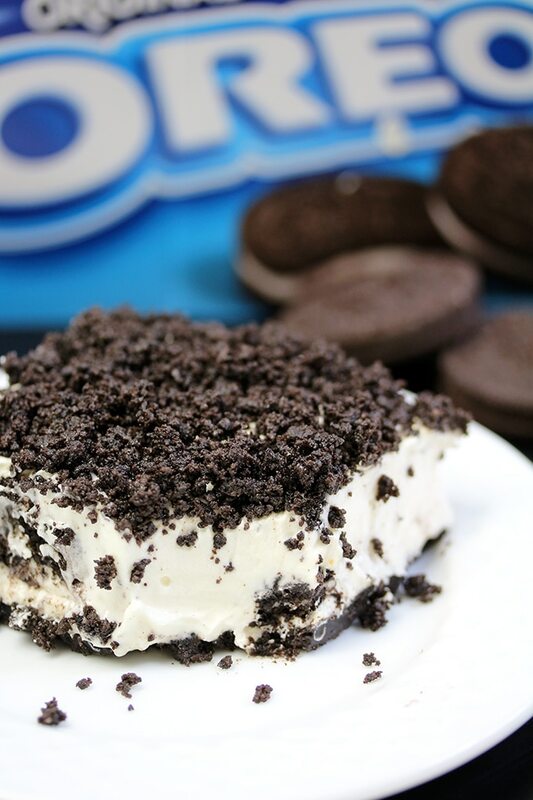 Save the rest of the Oreo crumbs for later. Set aside. In a large bowl, whip the heavy whipping cream until it forms stiff peaks. Set a site. In a separate large bowl beat cream cheese and sugar until creamy. Add vanilla and beat some more. Add beaten heavy whipping cream and mix with spatula until well combined. Add condensed milk and continue mixing until smooth and creamy. Gently fold in crushed Oreos. Spread evenly over the Oreo layer. 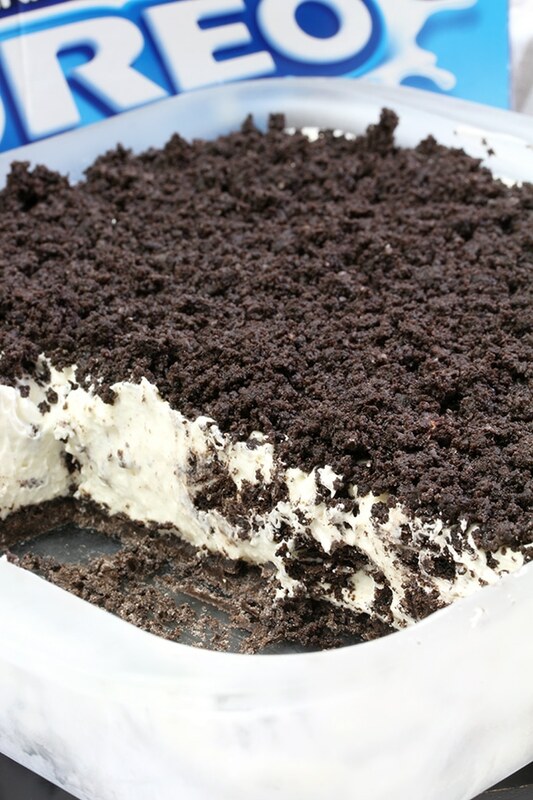 Frozen Oreo Dessert is great for parties when you prepare lots of food, because quick desserts make a great choice. This amazing dessert is so delicious that everyone likes it. My son always helps me to prepare the desserts he likes. This time, too. He was enjoying Oreo cookies while waiting impatiently for the dessert to cool. Chocolate and oreo fans should check out our category > Chocolate Recipes and most popular Oreo recipes > Mint Oreo Chocolate Truffles, Easy No Bake Oreo Mint Cheesecake and No Bake Pumpkin Oreo Cheesecake. If you are looking for some great desserts pay attention to our page Desserts and for all those who hate spending too much time in the kitchen, we recommend our page with Easy recipes. Every bite of this quick & easy dessert is a true pleasure. 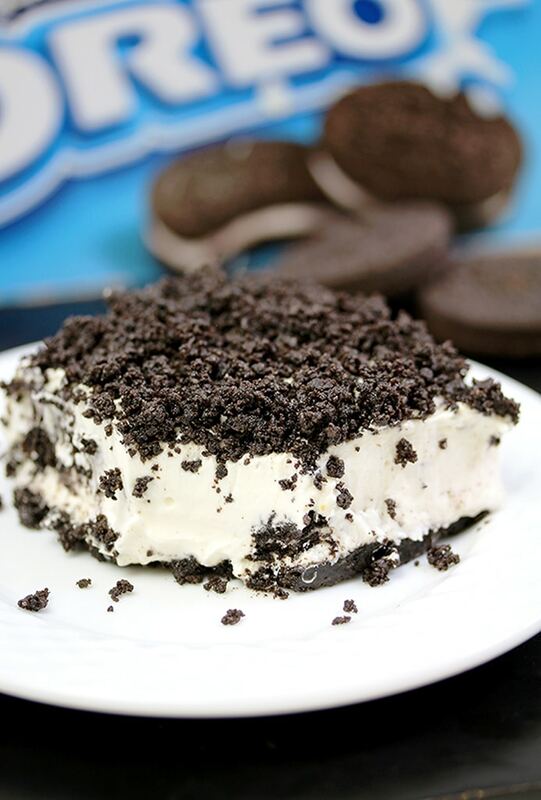 Enjoy in your own way with Easy Frozen Oreo Dessert! Save recipe HERE to Pinterest! Spread ½ of it in 8x8 or 9x9 inch square baking pan and press with your fingers or some firm object to form a layer. Freeze for min 3-4h, possibly overnight.